Worcester will not give up the current boundaries of their Academy network "without a fight", says the Premiership club's director of rugby Dean Ryan. Reports claim the boundaries may be under threat when Wasps complete their relocation to Coventry this summer. Two of Warriors' six Academy centres are based close to Wasps' matchday home at the Ricoh Arena - at Barkers Butts, in Coventry, and at Warwick School. But Ryan insists: "There's nothing been decided on Academy boundaries." 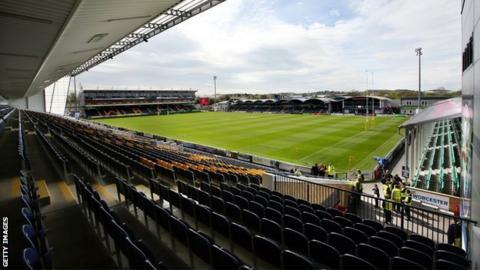 Warriors first publicly expressed their concerns over this emotive issue in September 2014, when reports first surfaced about Wasps' initially denied move to the Midlands. That was when Warriors were a Championship club, following their one-season relegation from the Premiership - four months after their expensive Academy expansion project had commenced. Since then, Warriors have spent over £1m further investing in their six Academy centres across the Midlands - and Ryan is adamant that the club will be continuing dialogue with the ruling bodies, the Premiership and the Rugby Football Union. "Anything that has been said is premature," he told BBC Hereford & Worcester. "The club won't give up their Academy boundaries without a fight, just because somebody has taken a commercial decision to sit themselves in the Midlands. "There seems to be a view that it can be moved around and the boundaries rejigged but it's not the view of the club. We will be fighting hard to maintain our boundaries. People just go and make decisions and expect clubs like Worcester to sit by the wayside. That's stopped. "We've no idea where it's going to end up, but I can give everyone reassurance that we'll fight for all the work and investment we've already put in." Apart from their own central Academy at Sixways, Worcester Warriors have six further regional academies outside the Worcestershire border, to help attract and nurture young talent into the professional rugby union ranks. Two are in Herefordshire, at the Hereford Cathedral School, Hereford and at Luctonians Rugby Club, Leominster. Two are in Warwickshire, at Barkers Butts Rugby Club and Warwick School. One is in Shropshire, at Telford College of Arts and Technology, and the other is at King Edward's School in Birmingham. Prior to Wasps' move to play their matches at the Ricoh in December 2014, Worcester housed the only professional rugby union side in the west side of the Midlands. The Premiership club's catchment areas currently extend to the boundaries with Sale in the north-west, Gloucester in the south-west and in the East Midlands with Leicester and Northampton. Meanwhile, Worcester winger Sam Smith has joined London Scottish on loan for the rest of the season, where his Warriors team-mate Alex Grove is already on loan.